Just recently after the releasing of the PlayStation 4 Console. Sony released a new PlayStation App for iOS and Android devices. 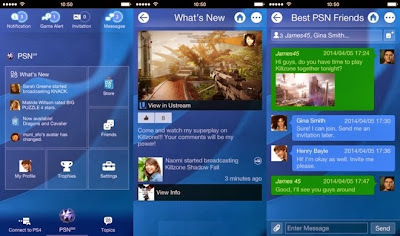 The App is mainly designed to help users connect with their PS4 console from anywhere they are with the ability to see their PlayStation Network friends, see what they are playing, compare trophies and also chat with them. Also, you can receive notifications, game alerts and invitations on the App and can use your phone as a mobile keyboard to enter text on your PS4, which is much more better than doing it through the game controller. The most important feature so far is being able to browse the PlayStation store and being able to check prices and even purchase games from within the App. The purchased games are then pushed to your PS4 and downloaded for you, so you can purchase a game when you’re out and if you have a fast internet connection it would be downloaded and ready to be played by the time you get home. The PlayStation App is currently only available in North America and Europe (basically where the PS4 is available) for free on the App Store and Play Store. If you reside in any of the countries where the PS4 is available right now then you can download the App from App Store or Play Store via the download link below. What do you think about this App ? Lets hear from you, Use the comment box below and don't forget to share this post with your friends.